Ditch Brodie (Sheen) is a radically awesome skydiver who you know is radical to the max because he works at a Jump Center. He is also the bad boy of said Jump Center. He’s probably spilled more Mountain Dew than you’ve ever drank. When Ditchington Brodie III (which may or may not be a variation on his name that we made up) meets the alluring Chris Morrow (Kinski), he becomes embroiled in an intrigue that involves the KGB, missing gold, thugs, goons, murder, and all manner of danger and mayhem. The skydiving man must become “Detective Ditch” as he attempts to get to the bottom of it all. And there’s only one way to stop the madness – more skydiving. In Ditch’s world, skydiving is the solution to all problems, even on the world stage. So while James Gandolfini and Christopher McDonald are on his tail, Ditch pulls his ripcord into heroic legend. We should all be more like Ditch Brodie. The 90’s “Terminal” trend hits the big screen just in time to capitalize on another 90’s trend - for all things outrageous, “Xtreme”, and radically awesome. Everyone was always talking about “feeling the rush”, or some variation thereof. Even Nastassja Kinski says at one point, “Is it a rush?”, referring of course to skydiving, because if it isn’t – not interested. 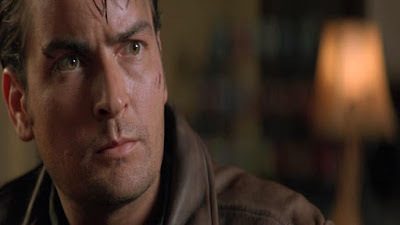 And who better to be our guide through the awesome world of rush-feeling than Charlie Sheen, Ditch Brodie himself? The thing about Charlie is he does have a lot of charisma and screen presence. He also has good comic timing and cool hair. A lot of these elements are important to carrying Terminal Velocity, because the plot is pretty weak. It’s all about the aerial stunts, and we give a lot of credit to the stunt people who worked on this film. They clearly went above and beyond. Of course, this wasn’t the only skydiving movie flying around at this time – there was also the same year’s Drop Zone (1994), as well as the somewhat later Cutaway (2000). 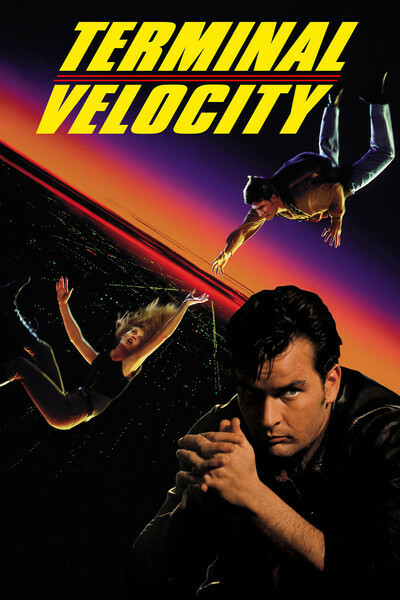 Terminal Velocity is bigger-budget Hollywood-stupid, but a lot better than anything Hollywood is putting out today. At least it’s an original idea, not a remake, sequel, or superhero movie, which are the exclusive province of Hollywood these days. It’s also a PG-13-rated middle-of-the-road Hollywood action thriller, enlivened by the cast and stunts. Of course, there are the requisite silly moments which make it worth watching. Director Sarafian, known to readers of this site as the director of Death Warrant (1990), backs off on the violence so he can turn in a movie readily accessible to a wider audience. Sure, there are some blow-ups, a couple of fights, and some gun-shooting, but nothing you wouldn’t see on TV. What he does deliver are skydiving scenes a-plenty, many of which include squealin’ guitar on the soundtrack because it was the 90’s, it was extreme, blah blah blah. You get the picture. Many people in our age bracket remember going to the video store and renting Terminal Velocity on VHS, or at least remember seeing it in the store. In light of that, the movie served its purpose – being an entry-level action movie for younger viewers. It still works in that capacity today, but now it also has the added bonus of having some nostalgia value for those are of an age who remember it from back then. So, strictly speaking, this may not be an all-time classic, but it has a special place on our shelf. Totally awesome review to the max. One might even call it radical!